The hit Broadway musical “Dear Evan Hansen” is headed for the big screen. The show about a lonely teenager who concocts an elaborate lie that spins out of control won six Tony Awards. It will be adapted for the screen by Steven Levenson, author of the musical’s book and the novel it was based on. The songwriting team of Benj Pasek and Justin Paul remains involved. All three are Tony winners. No casting has been announced, but it seems possible that Ben Platt, who originated the title role on Broadway and won a Tony for it, will reprise his role. His father Marc Platt is producing the movie, and also has “Rent Live!” coming up Jan. 27 on Fox. The touring production of “Dear Evan Hansen” just ended its Los Angeles run at the Ahmanson Theatre on Nov. 25, breaking box office previously held by “Les Miserables.” Its weekly gross was more than $2 million. The musical will play at the Segerstrom Center for the Arts in Costa Mesa Jan. 1-13, and return for another L.A. engagement in the 2020-21 season. You can’t bear the thought of going to the mall at this time of year — just finding a parking spot is a competitive sport. But Hanukkah is here. And your shopping list? Let’s just say it is a work in progress. Don’t fret. We’ve got you covered with great finds from local retailers that should satisfy your entire crew, including the family pet. Happy Hanukkah! Musical lovers will enjoy immersing themselves in “DEAR EVAN HANSEN: THROUGH THE WINDOW” ($50), the official behind-the-scenes book about the Tony Award-winning Broadway show starring former Harvard-Westlake student Ben Platt. Get it now, before the production comes to town next fall at the Ahmanson Theatre. Children’s Book World, 10580 1/2 W. Pico Blvd., Los Angeles. (310) 559-2665. childrensbookworld.com. 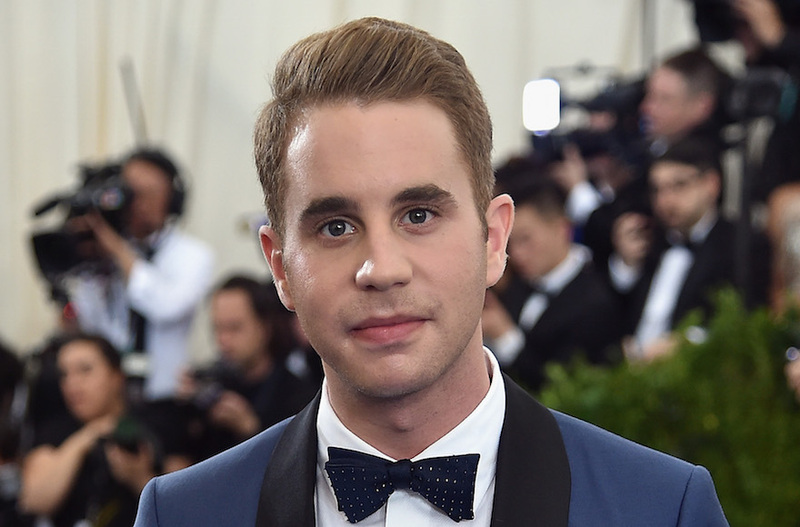 Local talent Ben Platt was among the big winners this year at the 71st annual Tony Awards, taking home the prize for actor in a leading role in a musical for his performance in “Dear Evan Hansen,” about a boy who gets caught up in a lie after the death of a classmate. While there were plenty of other big-name winners of Jewish interest — including Bette Midler and a play about the 1993 Oslo Accord — for many in Los Angeles, the night belonged to Platt, the son of Oscar- and Tony Award-nominated producer Marc Platt and his wife, Julie Platt, chair of the board of The Jewish Federation of Greater Los Angeles. Ted Walch, a longtime drama director at Harvard-Westlake, the high school Platt attended, said in an email that he was ecstatic at the young man’s accomplishment, but not surprised. During his speech at the ceremony at New York’s Radio City Music Hall, Platt, 23, recalled the early days of his acting career. “Dad, you’re my hero. You taught me that you have to be a decent human being to be a decent artist, and I love you for it. In other categories, “Oslo,” by J.T. 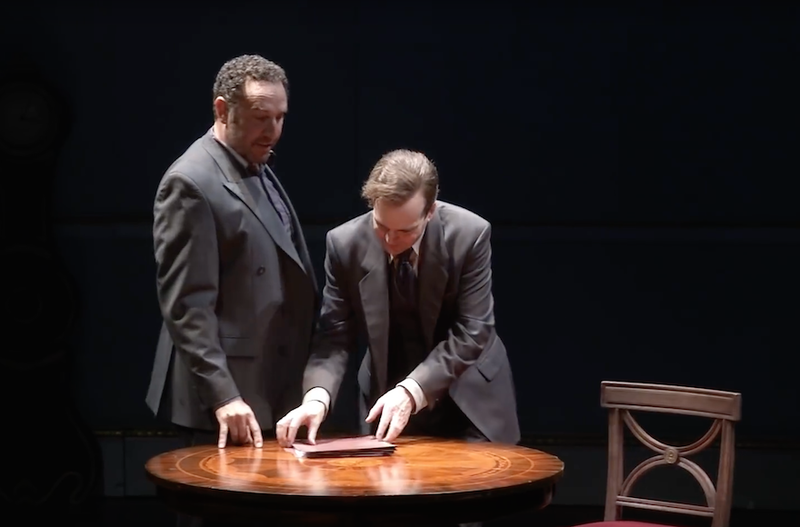 Rogers, about the Oslo Accord, won the Tony for best play after receiving rave reviews for turning a complicated piece of history into a fast-paced, entertaining three hours. Its Jewish lead actor, Michael Aronov, won for his portrayal of Uri Savir, an Israeli negotiator in the 1990s talks. Midler, the veteran Jewish actress and singer, won for actress in a leading role in a musical for “Hello, Dolly!” which also won the award for revival of a musical. This Sunday is the biggest night of the year for theater lovers: It’s the Tony Awards. Unfortunately, our crystal ball is at the shop for repairs — so we can’t say with certainty who the winners will be. But there’s one thing that’s for sure: The past year has been a standout one for Jewish actors, characters and writers who are plying their talents on the Great White Way. From a play about Israeli-Palestinian peace talks to a Broadway legend playing a Jewish cosmetics doyenne, here are seven shows with Jewish connections and themes that we expect to win big at the 2017 Tony Awards, which air Sunday evening on CBS. “Oslo,” J.T. Rogers’ play about the 1993 Oslo Accords, is widely considered the frontrunner for Best Play. It’s won nearly every theater award — the Drama Desk, the Lucille Lortel Award, the Outer Critics Circle, the Drama League, the New York Drama Critics’ Circle and the Obie. The play, in which Israelis and Palestinian negotiators — including Uri Savir, played by Michael Aronov, who is nominated for Best Featured Actor in a Play — struggle to hammer out a peace deal, received rave reviews for turning a complicated history into a fast, entertaining three hours. What’s particularly impressive is how riveting “Oslo” is — even though it’s common knowledge how the peace talks ended. “Oslo” has five more nominations: Best Direction of a Play (Bartlett Sher), Best Lighting Design (Donald Holder), Best Scenic Design (Michael Yeargan), as well as Best Leading Actor and Actress for Jefferson Mays and Jennifer Ehle, who play Mona Juul and Terje Rød-Larsen, the Norwegian couple overseeing the negotiations. Another Best Play nominee, Paula Vogel’s “Indecent,” may lack the momentum of “Oslo” — but also tells a very Jewish story. The play recounts the bumpy journey to Broadway of Shalom Asch’s controversial Yiddish play “God of Vengeance.” Seemingly ahead of its time, the 1906 play featured a love story between two women — one a prostitute and the other the teenage daughter of a religious man — and while it found success in Europe, the cast was arrested in New York for obscenity when the production moved uptown. The play is also nominated for Best Direction of a Play (Rebecca Taichman) and Best Lighting Design (Christopher Akerlind). Please buy a ticket soon to Indecent, asking your support. This show is the best i got in me. Want to share while we can. “Falsettos” may have closed in January, but this musical about neurotic Jews came away with five nominations, including Best Revival of a Musical. The musical revolves around a selfish but likable man, Marvin, who tries to navigate relationships with his ex-wife, his boyfriend, his psychiatrist and his son, Jason. The second act takes place two years after the first, and centers around both AIDS and a bar mitzvah, which, in the play’s moving conclusion, Jason holds in a hospital room. If we’re lucky, maybe they’ll open this year’s award ceremony — hosted by Kevin Spacey — with a rendition of the musical’s opening number, “Four Jews in a Room Bitching.” That’s a fitting description of Tony night at my house. It’s so nice to have our favorite Jewish diva, Bette Midler, back on Broadway where she belongs — and almost everyone agrees. As Dolly Gallagher Levi in “Hello, Dolly,” Midler has received nearly unanimous raves and is receiving multiple standing ovations a night, both during and after the show, and now she’s nominated for Best Lead Actress in a Musical. And while competition in this category is heavy on theater royalty — see: Christine Ebersole and Patti LuPone — it’s unlikely that anyone will beat the Divine Miss M, who plays a matchmaking meddler enlisted to find a wife for wealthy Horace Vandergelder (played David Hyde Pierce, also nominated), fully intending to marry him herself. “Hello, Dolly” is nominated for 10 Tony Awards, including Best Revival of a Musical. With only two competitors in that field —”Falsettos” and “Miss Saigon” — this widely-loved production is expected to win. If you’re hoping to catch Midler singing a tune from the show, you’ll likely have to score a ticket — for which box-office prices top out at $748: Midler was deemed “unlikely” to sing at the Tonys this year. Speaking of shoo-ins, Ben Platt, another Jewish actor, is probably the closest thing there is to one. I’m not a betting kind of woman, but I would put money on him taking home a Tony for Best Lead Actor in a Musical for his portrayal of anxiety-ridden outsider Evan Hansen, the title character in this dark musical about a boy who gets caught up in a lie after the death of a classmate. Ben Platt grew up performing at a Jewish summer camp — watch him talk about his Jewish childhood on “Late Night with Seth Meyers” here, where he also sings a rendition of “Luck Be a Lady” in Hebrew. Though “Dear Evan Hansen” is favored to win Tony’s final award of the evening — Best Musical — don’t rule out “Come From Away,” a touching, based-on-a-true-story musical about a small Newfoundland town. After the September 11 terrorist attacks, the population of Gander temporarily doubled when 38 airplanes were rerouted there. The musical is about how people come together and help each other through the darkest times. The Jewish connection? Aside from the show’s writers, married couple Irene Sankoff and David Hein (their previous show was called “My Mother’s Lesbian Jewish Wiccan Wedding”), one of the characters of “Come From Away” is a rabbi and, in a very moving scene, he sings “Oseh Shalom” as characters pray in many languages. Sankoff and Hein are also nominated Best Book for a Musical and Best Original Score. Other nominees include Best Featured Actress (Jenn Colella) and Best Direction (Christopher Ashley). Patti LuPone may not be Jewish, but she’s played a rabbi on TV. And now, she’s nominated for Best Lead Actress in a Musical in “War Paint,” which chronicles the rivalry between cosmetics magnates Helena Rubinstein (played by LuPone) and Elizabeth Arden (played by Christine Ebersole, also nominated in the same category). The musical, which is up for four Tony Awards, doesn’t shy away from the anti-Semitism that Rubinstein, a Polish immigrant, faced — she was denied an apartment at 625 Park Avenue, for example, but got her revenge when she bought the entire building. “War Paint” isn’t nominated for Best Musical — but it was just announced there will be a performance from the cast during the awards ceremony. Despite a crowded field of stellar nominees, it’s not that surprising that Ben Platt, star of “Dear Evan Hansen,” is the favorite to win Best Actor in a musical when the Tony Awards are handed out on June 11. He was practically born for the stage. Consider his upbringing: His older brother, Jonah, has made it to Broadway and his father, Marc Platt, is a prolific Hollywood and Broadway producer. Family lore has it that musical theater CDs accompanied every Platt family car ride. Something from those “Les Misérables” and “Miss Saigon” soundtracks apparently took hold. The tagline of “Dear Evan Hansen” is “You will be found.” Through this much talked-about musical, Marc and Julie’s Platt’s fourth child hasn’t simply been found, he has arrived. Ben Platt created the role of Evan, an awkward and isolated teenager who forges a connection with a grieving family based on a lie spread over social media. Directed by Michael Greif, who also helmed “Rent” and “Next to Normal,” “Dear Evan Hansen” features a score by the Oscar-winning “La La Land” team of Benj Pasek and Justin Paul. The show’s nine Tony nominations include best musical. Marc Platt is an Oscar- and Tony Award-nominated producer of more than 40 films, including “Legally Blonde” and “La La Land,” and Broadway’s “Wicked,” “Three Days of Rain” and “If/Then.” (He also is nominated for a Tony this year as the producer of the play “Indecent.”) Julie Platt is one of the L.A. Jewish community’s most committed leaders and philanthropists, serving as chair of the board of The Jewish Federation of Greater Los Angeles and as a board member of Camp Ramah, among other organizations. The foundation of Ben Platt’s Jewish identity was developed early. Like his siblings, Ben went to day school at Sinai and attended Camp Ramah. Values learned there are particularly helpful now, said Platt, who won rave reviews for playing the demanding role of Evan Hansen. Ben Platt has been with “Dear Evan Hansen” since its development more than three years ago, playing the role in productions at Arena Stage in Washington, D.C., off-Broadway’s Second Stage Theater and now Broadway. In addition to its box-office success and critical accolades, “Dear Evan Hansen” is resonating with young audiences and opening up conversations between parents and children about such issues as suicide, bullying and the dangers of social media. The musical’s fans often approach Platt to share intimate stories of their own experiences. “Evan Hansen” is light years away from the 6-year-old Ben Platt who acted in and directed backyard plays and portrayed the prince in “Cinderella” at the Adderley School for the Performing Arts. In 2002, when the producers of a three-performance summer production of “The Music Man” at the Hollywood Bowl needed a boy to play opposite Eric McCormack and Kristin Chenoweth, they called Adderley. The school recommended Platt, who got “The Music Man” gig and followed it up in subsequent Bowl engagements of “Mame,” “Camelot” and, fittingly, “The Sound of Music.” As an 11-year-old, Platt appeared at the Ahmanson Theatre as part of a national tour of Tony Kushner’s and Jeanine Tesori’s “Caroline, or Change” that also took him to San Francisco. Ben Platt frequently encounters aspiring actors seeking advice. He continued to act in high school. Ted Walch, a longtime drama director at Harvard-Westlake who had known the Platt siblings, tabbed Ben for a role in a school production of “Gypsy” when he was 8. Seven years later, when Ben was a student at the school, he performed in several plays and musicals, including “Our Town,” “Pippin,” “City of Angels” and “Into the Woods.” He also was a member of the campus improvisation group, The Scene Monkeys, which had been started by his brother Jonah. And although he already had notched several professional theater credits by the time he came to high school, Platt was not simply the drama kid. His high school roles ranged from a fop in “The Servant of Two Masters” to a father in “Our Town” to the title role in the musical “Pippin.” Max Sheldon, an actor-writer and fellow Harvard-Westlake alum, recalls working out a complicated dance sequence with Platt during their senior-year production of “Pippin.” Sheldon, who had the more extensive dance background, played the Leading Player to Platt’s Pippin. Platt briefly enrolled at Columbia University but took a gap year after being cast in the film “Pitch Perfect.” Before he could return to school, he appeared in the Chicago production of “The Book of Mormon.” He later made his Broadway debut in that musical, playing the misfit and “Star Trek”-loving missionary, Elder Cunningham. The Harvard-Westlake drama students were a tight-knit group and have remained close since graduating. Many of them have seen “Evan Hansen” multiple times, and Walch noted with satisfaction that when Platt received his caricature at the famed New York theater-district restaurant Sardi’s, several of his high school friends were there to share the moment. While Platt has been with “Dear Evan Hansen,” another Harvard-Westlake classmate and close friend, Beanie Feldstein, is performing up the street in the Tony-nominated revival of “Hello, Dolly!” On two-show days, Platt and Feldstein often meet between performances. The knowledge that her son has a network of friends close by is comforting to Julie Platt, who, along with Marc, goes to New York for regular visits. The family gathered there for a Passover seder, which fell on a Monday. Ben participated but used a whiteboard to help conserve his voice. Wolpe can relate. Having seen Platt perform several times in recent years, the rabbi found “Evan Hansen” satisfying but also difficult to watch. The Tony Awards ceremony will be televised on CBS at 8 p.m. June 11. Is Meghan Markle Jewish? The internet is confused.